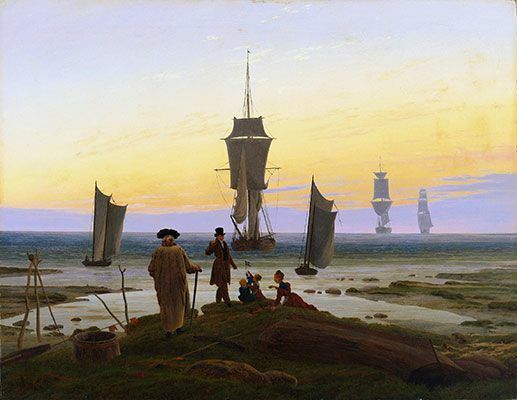 The below artworks are the most important by Caspar David Friedrich - that both overview the major creative periods, and highlight the greatest achievements by the artist. 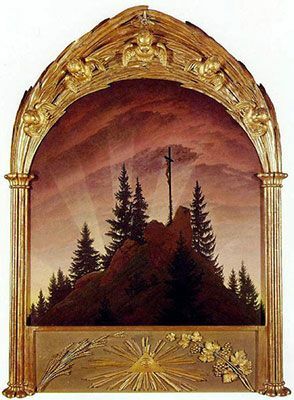 Artwork description & Analysis: Commonly referred to as The Tetschen Altar, Friedrich's The Cross in the Mountains features a pine-covered mountaintop upon which stands a large crucifix. The cloud-filled sky is rendered in shades of red, pink, and violet which fade from dark to light from the top to the bottom of the canvas. Five beams of light emanate from a distant, unseen horizon. The shaped canvas is set in an elaborate frame, designed by the artist but carved by his friend Gottlieb Christian Kuhn. The frame features a range of Christian symbols, including the heads of five baby angels, a star, grapes and vines, corn, and the eye of God. This painting, one of his earliest, embodies many of the Romantic motifs and themes he would address throughout his career, most notably the important symbolism of the landscape itself. Indeed, although the altarpiece includes a crucifix, the emphasis is placed on the spiritual essence of nature. He described the work: "High up on the summit stands the cross, surrounded by evergreen fir trees, and evergreen ivy twines about the base of the cross. The glowing sun is sinking, and the Saviour on the cross shines in the crimson of the sunset ... The cross stands on a rock, as unshakably firm as our faith in Jesus Christ. Fir trees rise around the cross, evergreen and everlasting, like the hope of men in Him, the crucified Christ." This was a groundbreaking reinterpretation of the genre of landscape painting giving it a new level of potential significance. It reflected Friedrich's belief that the divinity of God could be best found in nature. While Friedrich was deeply religious, aspiring to paint an image that would convey the power of God more fully than possible through words, his approach was highly controversial. When the artist opened his studio to the public in 1808, allowing them to view this work, the 19th-century art critic Wilhelm von Ramdohr argued that a landscape could not function as an altarpiece. 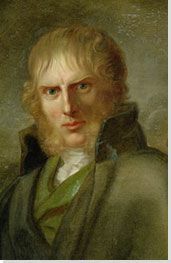 Friedrich and his supporters publicly defended the painting and the resulting debate helped to build Friedrich's reputation. 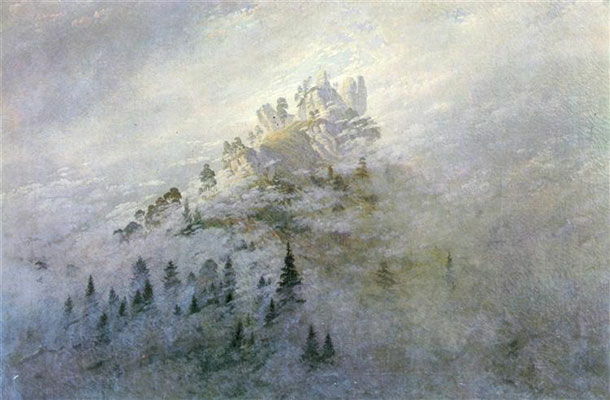 Artwork description & Analysis: This simple painting of a mountain peak awash in a white mist of early dawn fog, surrounded by barely discernable pine trees and rocky outcroppings manifests Friedrich's ideals of the Romantic landscape. This majestic, remote view of monumental nature implied a connection to a higher power, particularly in its scale and use of light. Here, a break in the clouds allows light to shine through, as if illuminating the mountain peak with a divine light. To achieve this religious message, the depiction of mist was an important symbol for the artist. As he explained, "When a landscape is covered in fog, it appears larger, more sublime, and heightens the strength of the imagination and excites expectation, rather like a veiled woman. The eye and fantasy feel themselves more attracted to the hazy distance than to that which lies near and distant before us." Positioning us before this vast expanse with no sense of foreground, he wanted to immerse the viewer in the experience of the natural realm; a dramatic field that he felt most closely expressed the beauty and power of God. This approach created a new possibility for religious painting, based not in overt Christian symbolism, but in direct contact with awesome beyond the control of man. 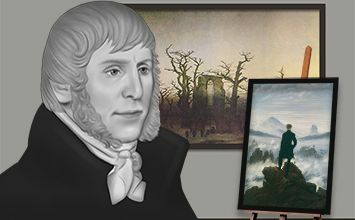 Artwork description & Analysis: Arguably one of Friedrich's most important and well-known works in his oeuvre, this painting launched the artist to international fame when it was exhibited with The Abbey in the Oak Woods (1808-10) at an 1810 art exhibition in Berlin. A vast, empty landscape is dominated by the top three quarters of the canvas, which depicts a blue-gray sky and green sea. The foreground is an uneven swath of beige land where, just left of center, stands a man. Although his back is to the viewer, he is identifiable by the long, dark robe of a monk. The canvas is filled with large expanses of color, punctuated by small brushstrokes of white to denote a few crests of waves and birds in the sky. It is a masterpiece of minimalism and pictorial restraint, while still conjuring a felt sensation of awe, wonder, and humility. The positive reception of this pair of paintings contributed to Friedrich' election as a member of the Berlin Academy and also drew the favor of Prince Friedrich Wilhelm Ludwig of Prussia, who purchased the two exhibited paintings for the royal collection; a prestigious honor. Beyond the accolades, however, this work demonstrates Friedrich's experimental spirit. Any traditional approach to landscape painting has disappeared. At a quick glance, the compositional structure appears uneven and lacks a perspective focal point. Rather than illustrate a scene, Friedrich has created an opportunity for the viewer to experience a range of emotions, only suggested by the artist. If he had included more details, the viewer would be tempted to invent a narrative or story, but with this bare minimum, we are felt with only sensorial information. This new way of creating landscapes reinforced the idea that the viewer should contemplate the sublimity of the natural world and read into it an expression of the spiritual. The potential for deep meaning in a sparse, non-narrative style, would be critical to modernist abstraction. This painting, in particular, has been linked with the post World War II Color Field paintings of Mark Rothko, also intended to cultivate a spiritual experience for the viewer. While Friedrich often painted landscapes without a human presence, this painting represents his second approach to investing the landscape painting with a deeper significance and connection to the viewer: the use of a proxy or stand-in. 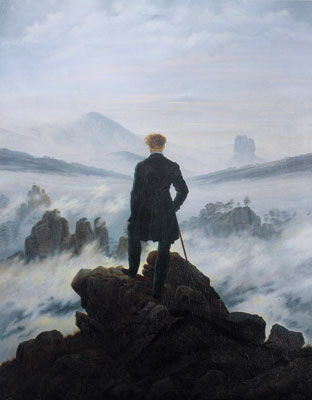 The solitary figure turned towards and in communion with the landscape, known as "ruckenfigur," is one of the key ways German Romanticism differentiates itself from French and British Romanticism. Although internationally, Romanticism was occupied with the connection between man and nature, British painters tended to emphasize more nostalgic or bucolic landscapes, while the French painters often suggested man's desire to conquer nature; the German approach depicts man's attempt to understand nature and, by extension, the divine. 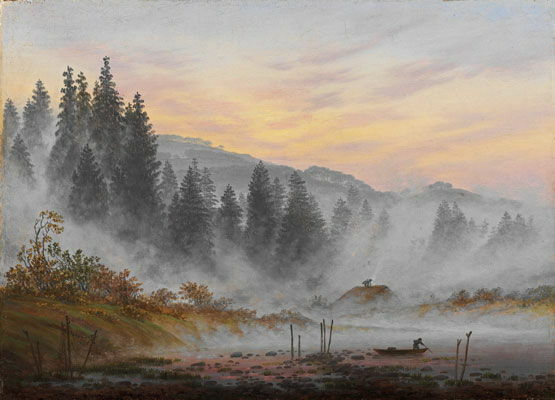 This preference for an emotional connection between the viewer and the image replaced more literal or illustrative approaches, exemplified by Friedrich's moody landscapes, which often thrust the viewer into the wilds of nature. 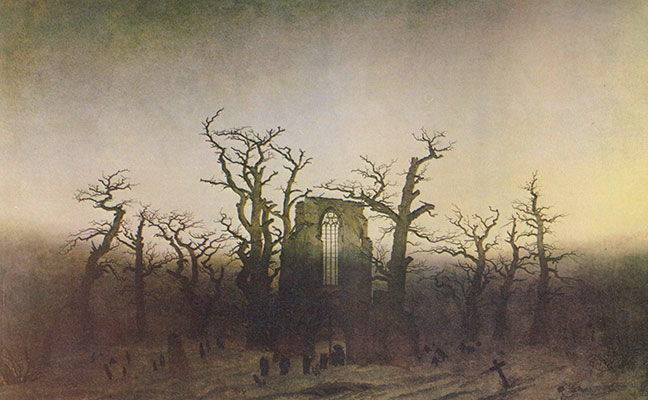 Artwork description & Analysis: A study in subtle colors, rendered in soft shades of browns, yellows, and white, this painting depicts the crumbling remains of a Gothic abbey set amongst a field of barren leafless trees. The outlines of cross markers and tombstones are scattered around the remaining wall of the abbey entrance with its tall thin window. The bare outline of a few monks can be seen about to pass through what remains of the church's entrance, perhaps making a pilgrimage to mourn the dead. Friedrich often included traces of Gothic architecture, here in the form of the abbey ruins, in his works. This reflects a nationalistic pride in the monuments of the German Gothic past that were particularly significant during the years of Napoleonic occupation. The Gothic was also a period that imbued spiritual significance into a range of artistic production. 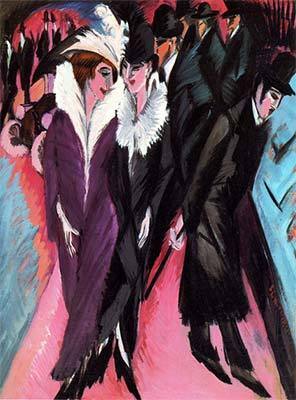 20th-century German Expressionists would also look back to the Gothic as a source of national and religious strength. 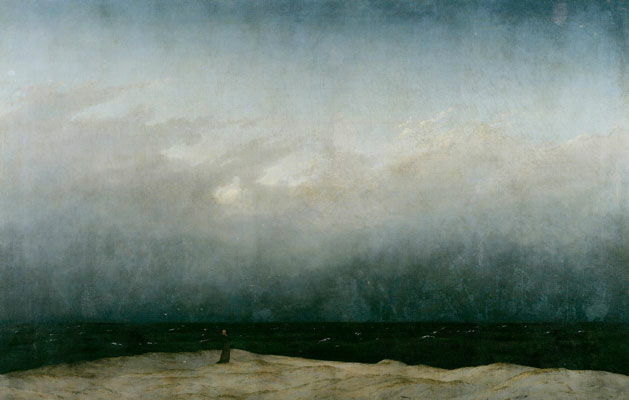 Additionally, this painting shows Friedrich's masterful use of negative space and absence to create a sense of loss and longing. The depiction of ruins and the barren trees suggest death and abandonment, compounded by the dull, muted color palette and uneven compositional balance. Like his The Monk by the Sea, the majority of the canvas depicts only empty sky. Yet the message is not nihilistic: soft light suggests the sun shines down through the clouds; the oak trees are barren, but not dead. There is a promise of rebirth and resurrection. Artwork description & Analysis: Wanderer above a Sea of Fog (sometimes also referred to as "Sea of Mist") depicts a lone man, formally dressed and holding a walking cane, standing on an outcropping of rocks looking out at an inhospitable expanse. He stands perfectly still, only his hair ruffled by an unseen wind, against a tumultuous field that churns at his feet. In the background is a sky filled with white puffy clouds and the outline of mountaintops barely visible through the mist. As the man contemplates the vastness before him, the sublimity of nature is demonstrated not in a calm, serene view, but in the sheer power of what natural forces can accomplish. Friedrich is known to have made political statements in his painting, often coded in subtle ways. The costume the figure wears was worn by students and others during Germany's Wars of Liberation; by the time of this painting, the clothing was forbidden by Germany's new ruling government. By deliberately depicting the figure in this outfit, he made a visual, albeit understated, stand against the current government. The political nature of this work did not stop there however; his work (especially this painting) were adopted and abused by the Nazi regime as symbols of intense German nationalism. Because Friedrich replaced more literal illustration with merely suggestive messaging, his paintings were easily reinterpreted to fit new political intentions. It would take more than three decades, into the 1980s, for his work to be viewed and appreciated once again without the taint of Nazism. 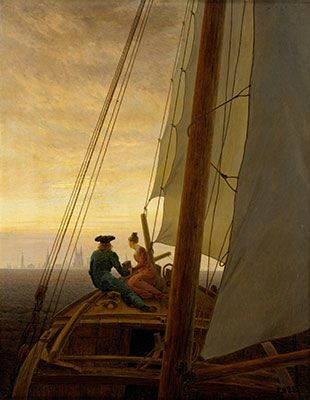 Artwork description & Analysis: Caspar David Friedrich's On the Sailing Boat features the bow of a ship heading towards the horizon. Two figures, a man in a blue suit and hat and a woman in a pink dress with white lace collar, hold hands while looking at what lays ahead. The right side of the canvas is consumed by a closely focused depiction of the sail and the boat's mast. In the distance, the viewer can discern the faint outline of buildings, silhouetted in mist. The largest expanse of the canvas is occupied by a glowing yellow sky. A departure from his usual landscape formula, with its implied narrative and more traditional use of symbolism, this work creates a connection between the painting's viewer and the scene. We are a passenger on the ship, a witness to the intrepid couple on their journey. This painting was made one year after Friedrich's marriage to Caroline Bommer and shows his transition from lone figures to the occasional depiction of a pair. Often, these female figures were based on his wife's image; in this painting the couple depicted are believed to be portraits of the artist and his wife. Rich in symbolism, their joined hands reference their new, happy union and their presence on a moving ship a metaphor for the new life they are embarking on. Despite this conventional symbolism, Friedrich's approach to composition remains quite experimental, particularly in his use of an unbalanced composition. The verticality of the ship and the horizontality of the horizon are not arranged with traditional proportions, and the sharply foreshortened presentation of the ship broke with the contemporary expectations for composing a picturesque landscape. Artwork description & Analysis: A small work measuring only 8 ? x 12 inches, Morning was intended to be part of a cycle of the times of day. It is a scene of quiet stillness that evokes the early morning. The mist lies low, wrapping around the pine trees in the midground, but beyond the sun rises above the distant mountains. In the foreground, a lone figure rows a boat, perhaps setting out from the small house whose roof is just visible about the fog. The sky is awash in the colors cast by the rising sun: yellow, orange, violet, and soft pinks. Although Friedrich carefully depicted the sensations of the natural world, his paintings were created in the studio, based on simple sketches done in nature. They are imagined compositions, in which Friedrich manipulated elements for dramatic or symbolic emphasis. Later, as he became increasingly isolated and depressed, landscapes such as this also allowed him to contemplate life and its end. This is confirmed in his writings on this series in which he states, "Today for the first time the normally so glorious countryside cries out to me of decay and death, where before it has only smiled to me of joy and life. The sky is overcast and stormy, and today it casts its monochrome winter coat over the lovely colored mountains and fields for the first time. All nature lies before me drained of color." Along with the writings that reveal his state of mind as he worked on these paintings, the decision to create these works as a cycle supports them being viewed as a visual expression of the examination of life from beginning to end (or morning to evening). A poetic expression on life, they are the visual representation of the Romantic view of life, death, and the divine. Artwork description & Analysis: Set against a vivid blue sky, the focal point of the painting is the wreckage of a ship that has crashed into the ice and the rocks of the shore. On the right of the canvas, a small portion of a ship's hull is visible rising out from broken chunks of ice. The symbolism of this painting has been interpreted on political, autobiographical, and spiritual levels. Certainly, this scene of devastation suggests a deeper meaning; the work is not associated with any historical or literary source. Some have viewed it politically as a statement against the German government. According to the scholar Norbert Wolf, "The sailing ship being slowly crushed by pack of ice in a polar landscape otherwise devoid of signs of human life may be understood as a pathos-laden metaphor for a catastrophe on an epochal scale, whereby visually coded references to ruin and nevertheless to hope, to destruction and to regeneration, combine into a symbolic protest against the oppressive 'political winter' gripping Germany under Metternich." Other scholars have read autobiographical interpretations into the painting that reference the loss of the artist's beloved brother in a childhood accident. Friedrich himself had fallen through some ice and his brother died trying to save him. We know that, in his later years, Friedrich often used his paintings to reflect of questions of loss and mortality, coming to terms with the tragedies of his childhood. 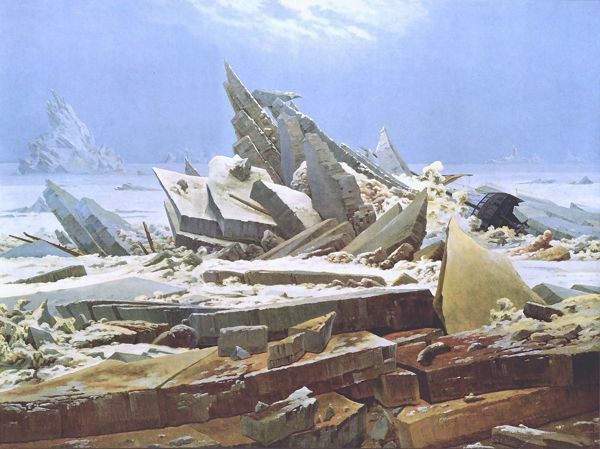 Universally, the destruction of the man-made vessel at the hands of powerful and unforgiving nature fits with Friedrich's admiration and awe of the natural world. In this inhospitable realm of frozen seas, man's audacity and self-confidence are dashed like children's toys by the immense force of the ice. We are dwarfed by the powers beyond our control. This painting was not easily understood or appreciated when it was first created. It did not comply with either the expectations that such a scene of destruction should be rendered picturesque or else overtly moralized. Many contemporaries failed to understand the work and one critic wrote, "If only the ice painting of the North Pole would melt once and for all." Artwork description & Analysis: In The Stages of Life, five ships are at sea, moving toward a distant horizon. They are mirrored by five figures depicted on the grassy shore in the foreground: two small children, a boy and a girl, are watched by a young woman while a middle-aged man turns back from the water to address an elderly man in a long formal coat, hat, and cane. Dating from the later years of Friedrich's life, when the artist had withdrawn into near solitude, scholars have argued that the elderly man is a self-portrait and the others represent Friedrich's nephew and his three children. This painting is one of the artist's last works before multiple strokes prevented him from working in oils. An allegory on the passing of time and the journey of life, the various stages of life are echoed in the five ships that move from the shore (start, birth) to the horizon (death, infinity), as well as in time as depicted from childhood to old age. As was common in Friedrich's painting, the sky dominates a majority of the canvas, changing from shades of blue to a wide wash of orange and yellow in the center, placing the time of day as early evening. As the sun sets and the ships move out to sea, there is a sense of peace, completeness, and acceptance. First published on 14 Jul 2017. Updated and modified regularly.